Fortress Of Freedom Board :: View topic - Coalition Protest At Nathan Phillips Square! 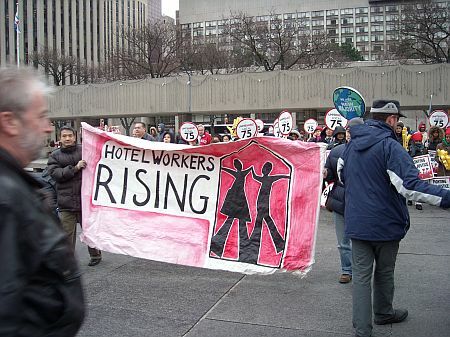 Coalition Protest At Nathan Phillips Square! 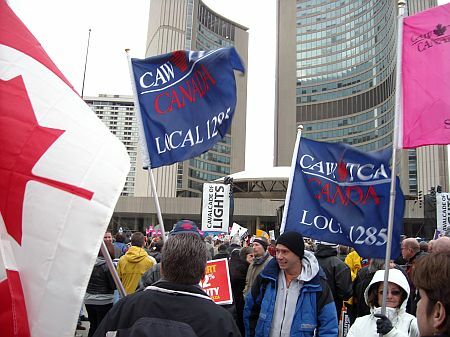 Posted: Sat Dec 06, 2008 8:07 pm Post subject: Coalition Protest At Nathan Phillips Square! 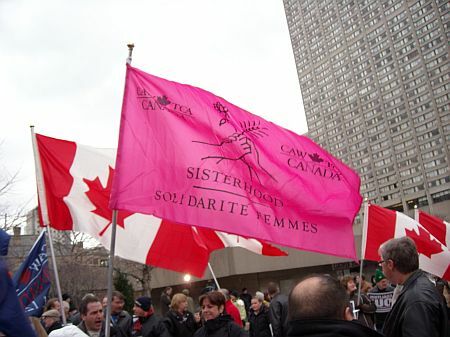 It was very cold on this December 6, 2008 at Nathan Phillip's Square in Toronto, a protest in favor of a federal coalition of opposition parties took place with an estimated 1,000 participants. 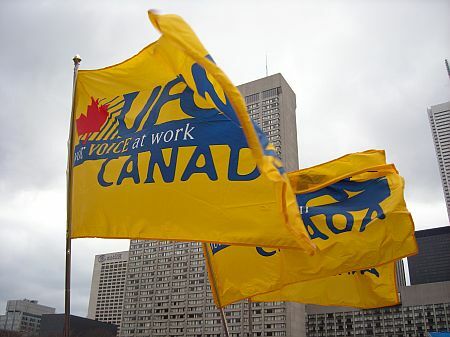 The story of this Federal coalition between three national opposition parties in Canada's parliamentary system goes back to what they would call the inflexibility of the ruling party of the Conservatives to work with the smaller parties toward common goals. So the three decided to pool their votes in government and defeat the Conservatives in a budget vote which would bring down the government and allow the three to seize power via a contract between them and endorsed by Canada's Governor General. That did not happen and the Governor General ended up closing the government down until the new year. These protests were to rally support on both sides in this publicity war between the two camps. All three of us at International Association Of Independent Journalists decided to report of the event from three sides. 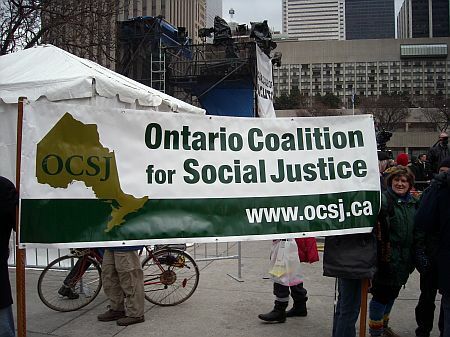 I would report on the protests for the coalition and Sam would report on the anti-coalition side taking place at Queen's Park just a couple of blocks away from Nathan Phillips Square. Maurice would do his own thing and remain neutral in reporting. Pro-coalition support was well organized much of it being union support. They had a stage set up and a decent sound system which was used by a group of yelling and drum beating artists prior to the speakers addressing the crowd of about a thousand participants. The highlight of the day was Stephan Dion (leader of the Liberal Party) and Jack Layton (leader of the NDP Party) giving speeches to the crowd and vocal protestors. 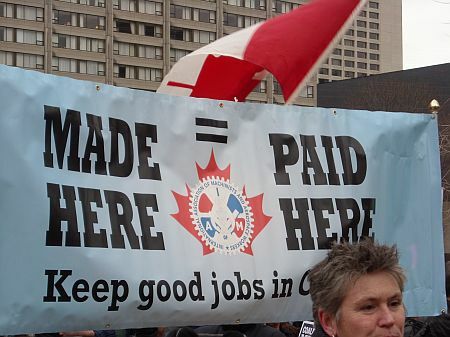 Support from the Canadian Auto Workers. 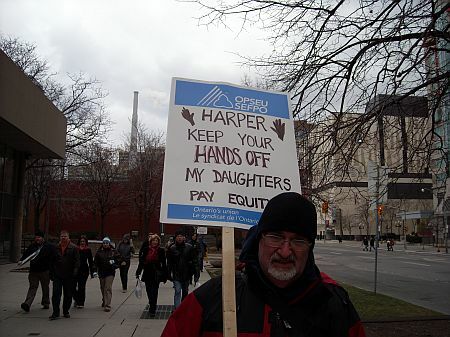 This was a well organized event in the Liberal and NDP stronghold of southern Ontario. They had everything going for them in a hospitable city and populous with speakers of merit and the national media to back up all those professionally printed up placards and flags. This was a bit different from the anti-coalition protest up the street. I would say from a tactical viewpoint that the pro-side did it right for the left.